This release is a free update, available now. Staying up for late-night publishing? Turn down the lights with Dark Mode! Introducing an all-new, darker color scheme for Vellum. With low-brightness backgrounds and a light-on-dark editor, it’s designed to be used in dim environments. Dark Mode can be just the thing for working at 2 AM, but we won’t blame you if you want to use it all the time! Dark Mode requires macOS Mojave. You can activate it in the System Preferences for your Mac. 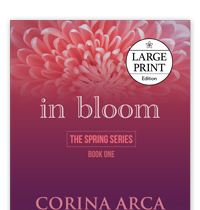 Large Print editions are now generated into a separate folder, and won’t overwrite a standard print edition. You can now use the Numbered toggle to disable numbering for Parts. 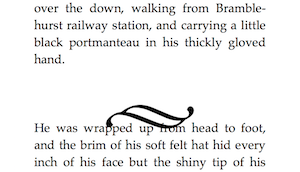 You’ll find these additions in Vellum 2.5.2, a free update. This version requires macOS Sierra or newer. As far as we know, these issues only occur when you sideload a book for testing. Books purchased by readers and delivered by Amazon should not exhibit these issues. We’ve reported these issues to Amazon, but we have no way of knowing when they will address these problems with the Kindle for Mac program. 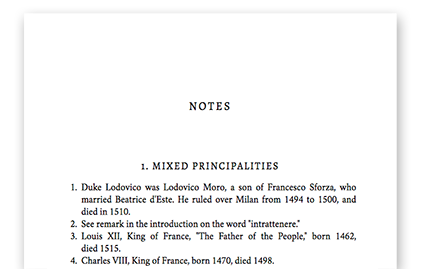 To proof your book, we recommend using Kindle Previewer. 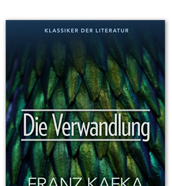 Kindle Previewer is the most accurate way to view your book, and will not exhibit problems like the above. 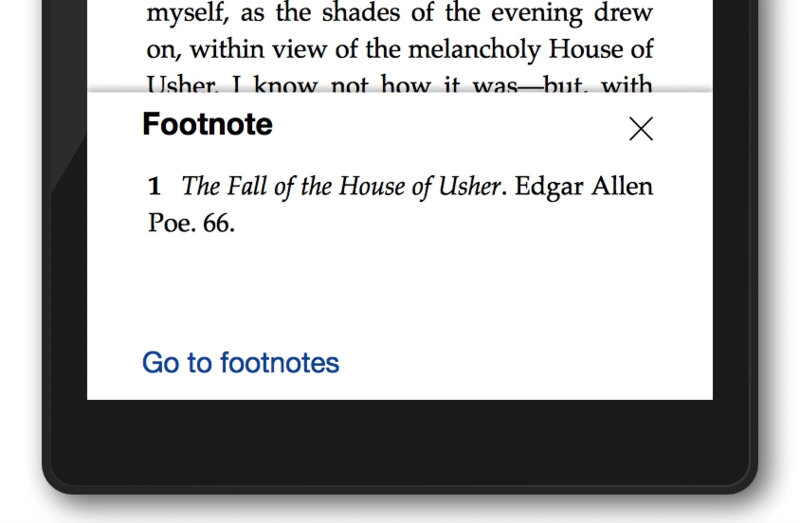 Vellum makes use of Amazon’s KindleGen tool to convert ebooks to their proprietary mobi format. When running Mojave, your Mac will warn about this program because it has not been built in a 64-bit format, something Apple will require in future versions of macOS. 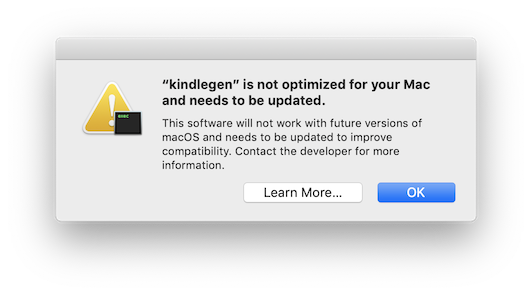 While Amazon has released 64-bit versions of Kindle Previewer and Kindle for Mac, they have not yet published a 64-bit version of KindleGen. Until they do, you will periodically see this warning when you generate for Kindle. This does not affect your generated books. We recognize it can cause concern, though, so we are investigating ways to create ebooks for Kindle without triggering this warning. Vellum 2.3 is a free update. To get it, use Check for Updates in the Vellum menu. Or download and install Vellum from vellum.pub. Vellum 2.2.3 improves compatibility with the upcoming macOS Mojave. 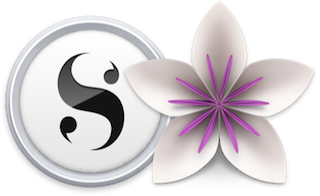 We know many Vellum users love using Scrivener to develop their story. We’re excited to share that bringing that story into Vellum just got a lot easier. 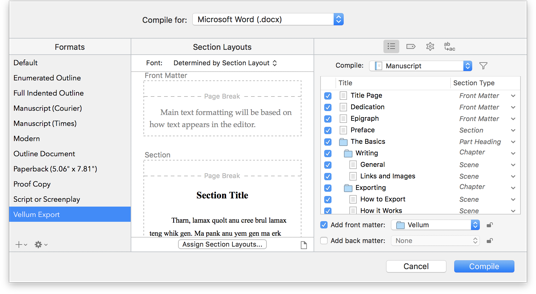 Select the new Vellum Export option in the Compile sheet and Scrivener will produce a docx file especially for Vellum. And with Vellum 2.2.2, links and formatting options like block quotations and sans-serif will import perfectly. All this makes it even easier to format your book with Vellum, and it’s available today!